Did you know that the Hypochlorous acid that is produced by Chanson Water ionizers is also produced naturally by our body? For those of you not familiar with Hypochlorous it is a powerful antimicrobial that can fight off and kill infection, germs, and invading pathogens. Hypochlorous acid will kill such powerful bacteria as Staph and E.coli on contact. It can also be effective in hundreds of disinfecting and sanitizing applications. When our body is being invaded by an infection, the offending pathogen is overtaken, and engulfed by the white blood cells produced our body. Our body’s wonderful immune system reacts to this outbreak before any damage can be done to the cells. 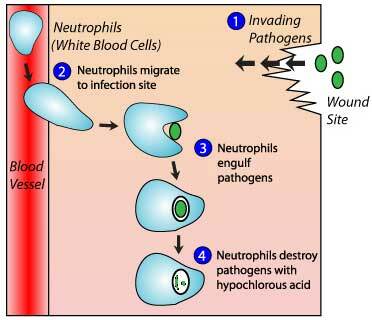 The white blood cells swallow the pathogen through a process called Phagocytosis (an anti-microbial process). After this has happened the white blood cell produces an oxidant called Hypochlorous acid (the same produced by the Chanson ionized acid water); this powerful anti-microbial kills the bacteria instantaneously, thereby eliminating the threat. This is a very powerful discovery. We at Chanson water have been touting the merits of Chanson ionized acid water for years, and to now know, that our body produces the same type of anti-microbial is amazing. Please see the below diagram. For a better understanding of how the process works in our body.